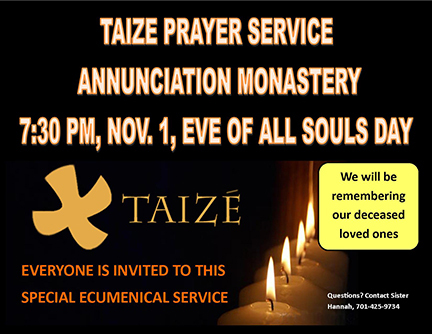 The Benedictine Sisters of Annunciation Monastery, Bismarck, invite the public to an ecumenical Taizé prayer service in the monastery chapel on the eve of All Soul’s Day, November 1 at 7:30 p.m.
Taizé prayer is a universal prayer of peace, hope, and healing. The service involves contemplation of God through chant, silence, and scripture. Those wishing to have their loved ones mentioned at this service may call Sister Hannah at 425-9734, comment on the Annunciation Monastery Facebook page, or email Sr. Hannah Vanorny at (hvanorny@gmail.com ).